You know, God never gives you more than you can handle. When He closes a door, He opens a window. He will wipe away every tear and restore you to your best life, now. He has a plan and a purpose for your life, and of course—God wants you to be happy. The other day, I looked for this in the Bible. Now it might not matter to you that much, but I trust that the Bible is the inerrant Word of God. I confess that He speaks of gifts and resolutions and life that we can only learn about by reading these Scriptures. Sure, we can learn a little about God by observing His creation: His bountiful trees, amazing galaxies in the heavens, and careful creation of humans. But God exposes the epic story, unseen battles, and incredible love in these revealed words of the Bible. Having a particularly sad day, I set out to find the Gospel of Happy. I opened the Bible to rest for a moment in God’s comfort and peace. I flipped open to a story in Genesis about children wandering around a desert. They were hungry and thirsty. I could only imagine trudging through the dust with not a drop of water. The sun piercing through a few layers of itchy cloth. They complained, exhausted, with the journey ahead of them. The little ones of this tribe had never known a permanent home where they were safe and secure. They all moved from place to place. Walking, uncomfortable, waiting, mumbling. And these were the chosen beloved people of God: His own children whom He saved from the miserable oppression in Egypt! These people were now free from slavery—only to endlessly hike in the hot desert. Strangely, God was with them. He was there, not making His people euphorically happy, but feeding them, leading them, and protecting them. All of this was a journey of sadness and pain—forty years of it in fact. And even though this was not the Gospel of Happy, they trusted that God was pressing them on to a hope even greater. Puzzlingly, God was with him; He was there. Not removing persecution to make him happy, but somehow allowing the pain, anger, sadness, sickness, and torture. Pages and pages, word after word; a life of struggle, repentance, and shame, and it was nothing but a path of fear, weakness, and prison. I searched the Bible for the Gospel of Happy and I reluctantly found another. Finally, I found a story told over and again. The one that I thought would finally bring my happiness. The splendid Word of God threw Himself into the mud of the earth. Mucous and blood, wails of pain welcomed our God-made-flesh one lonely night. He grew up in a dusty world of horrible people. He was abused and beaten as the truth of God was on His lips. Even His closest friends abandoned Him one by one. 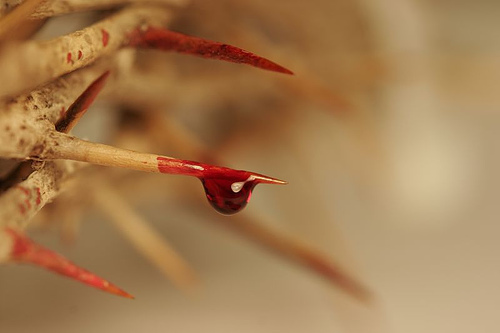 One hot day, He trudged to a hill of torture, was stripped naked, exposed to every eye, and then He died on a cross. Yet, this was the only Son of God. This was the only Person Who walked the earth with no sin. This was God’s beloved in whom He was well pleased. If He did not live the Gospel of Happy, I don’t know who can. Tragically, God was with Him. He was there. Not displayed lifeless to make our lives look happy. But there He was smashing judgment into mercy; sacrificing Himself for the sake of those who killed Him. Death, resurrection, forgiveness, life. It’s not a Gospel of Happy, rather it’s a story about God pressing on to a hope even greater. But, I wonder about the Gospel of Happy. I pray for restoration in my life, today. I rejoice in God’s blessings, right now. I want to avoid the pain, I don’t want it to be so hard, and surely, God wants the same thing for me—He wants me to be happy, right? The Gospel of Happy turns me into a god. My whims and decisions become the cornerstone on which God must build. My sinful desires are indistinguishable from the will of God, according to the Gospel of Happy. My depression and sadness trap God in a box, pronouncing Him dead if I am unhappy. The Gospel of Happy would never imagine suffering and death as the way to victory. If I simply hope for God to make me happy, I may have misunderstood the center of God’s happiness: the Gospel of Jesus. The Gospel of Jesus assures me no matter how sad I feel, God has never left. The Gospel of Jesus follows me all the days of my life—through the valleys of the shadows of death, and back up to the mountaintops. The Gospel of Jesus is good news because it is eternal life freely given to us, no matter what our lives looks like. Be assured, God is with you. He is here. Not making you blissfully happy. He is feeding you His body and blood for forgiveness, He is leading you from the font to the grave, He is protecting your eternal future with Him. This is not the Gospel of Happy—you’re trusting the Gospel of Jesus: pressing you on to a hope even greater.